Outsourcing your billing can be a great decision. Practices typically outsource billing when they feel they don’t have the people, space, resources, bandwidth or finances to keep billing in-house. There is a strong difference of opinion as to which model is less expensive. Most billing companies will charge 4% – 8% of net revenue, which is medical revenue minus any payer and patient refunds. Most medical billing companies charge on the lower side of the range for surgical groups and other high-dollar specialties and on the higher side of the range for primary care and other medicine specialties. Some states require billing companies to charge on a flat fee as opposed to a percentage, as it is felt that paying a percentage of revenue incentivizes billing companies to “game” the system in trying to maximize revenue. We work with many practices that either want to bring their billing back in-house again or want to outsource their billing again. For those wanting to outsource their billing, we offer a list of the danger signs to watch for when choosing a medical billing company you’ll be tied to in the years (contract are usually 3 years) to come. Danger Sign #1: They have no existing clients in your specialty. It’s true that most physician coders and biller are trained on all specialties, but coding and billing rules change annually, and if the billing company isn’t up to speed on the nuances of your specialty, how long will it take them to get there? Danger Sign #2: They will not give you any references except the ones on their pre-printed list. You know that saying – a company is not going to put any name on their reference list that won’t give them a glowing reference. Some companies give you their entire list of clients – they’re not afraid! If they only give you 10 names and you know they have 100 clients, you have to ask what’s wrong with the other 90? Danger Sign #3: They do not give you access to their system to look up patient accounts. This is where a system on the cloud makes everything so easy – the vendor assigns you a login and initial password and you can look at everything. Why wouldn’t you expect to have 100% access to your own data? Recently I heard of a billing company that would not give their practices access to their system because it was “proprietary.” What is proprietary about a billing system and what are they afraid you will see? Danger Sign #4: They do not allow you to run your own reports. This is similar to #3, but I have had billing companies provide me with reports that are not system-generated. In other words, they took the data from the system reports and entered it into a spreadsheet. So I don’t know if the numbers are real or not. I insist that all reports given me by a billing company be system-generated. They can give me a snapshot report that simplifies the information, but I want the system-generated reports as well. 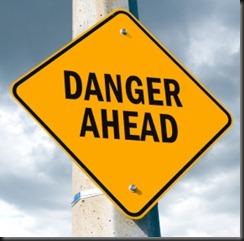 Danger Sign #5: They do not allow you to have an interview with the lead biller on your account. I want to know who will have this crucial role in my client’s financial wellbeing and who the staff will be communicating with over the coming years. I also want to know if the biller is a data-entry person or a real thinker. Danger Sign #6: You’ve never heard of the billing software they use. There are hundreds of billing systems out there and I am sure I haven’t heard of all of them. If I’ve never heard of this billing software, I’d like to know more about it. How long has it been around? How often is it updated? How many practices are using the software? What do you mean the billing company owner’s wife wrote the software and you are the only ones using it? Is the company big enough to put enough resources into ICD-10 or will they be one that will fall by the wayside before the big switchover? Danger Sign #7: They will not give you a daily report of their work completed. You need a daily report on charges, adjustments and payments. If you have access to their system, or they are working on your system, you’ll be able to generate this report yourself, but otherwise, you don’t know what they are doing until month-end. Think of what could potentially happen (or not happen) in four weeks. A service guarantee is one of the biggest reasons you outsource your billing. If they don’t have the bench-depth to cover staff losses or unexpected staff shortages, why are you even considering them? Danger Sign #9: They will not agree to do your billing on your software – they insist on using theirs. A lot of billing companies will only use one brand of billing software. Take it or leave it. Their profit is dependent on the efficiency and duplication of the same process over and over again. I understand that. But what if you have a system you like, and it is loaded with years of data, but for whatever reason you want someone else to staff it? You can outsource your billing, but don’t commit to losing your system when you’re happy with it. Danger Sign #10: They cannot integrate electronically and accept your charges from your EMR. Providers are taking the place of superbills (encounter forms, charge slips, etc.) by having their EMR orders translated into CPT codes. If you are doing this in your EMR (and you should if you’re not!) and you can’t feed that info into a billing system, you’ll have to go back to a paper system such as a superbill. Ask the billing company if you will have to print out anything on your side for them to do their work and use the answer to gauge the additional work outsourcing billing might be for your practice. If you do sign a contract with a billing company, make sure the contract language is very clear on how problems will be resolved. What happens if they don’t meet the service guarantee? What happens if they don’t have adequate backup and your claims aren’t sent for a week while someone is on vacation? The most dangerous time is in the early days when you are in transition from one system to another. Have a timeline for the switchover with very specific goals and penalties if the goals are not met. It’s always good to have a line of credit or a little padding to draw on during a billing switchover – you never know how smoothly things will go. Make sure the termination clause or end of contract term has language on when and how you will receive your data if the billing company is not using your software, and what the cost will be. If you would like to receive Manage My Practice articles via email click here to subscribe.